You are here: Home / Blog / Awesome trailer for "The Living Bird"
Awesome trailer for "The Living Bird"
Watch this terrific video trailer for a new book, "The Living Bird", from Mountaineers Books and the Cornell Lab of Ornithology. 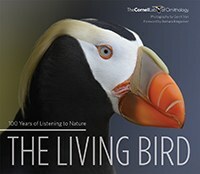 The Living Bird: 100 Years of Listening to Nature is a project done with the Cornell Lab of Ornithology for its 100th anniversary. The Living Bird includes more than 250 photos by Gerrit Vyn, a Seattle-based wildlife photographer who is also a producer for the Cornell Lab. Thanks to the amazing work behind this book, The Living Bird has been getting lots of media attention. Gerrit and Scott Weidensaul, who contributed an essay on the secret lives of birds, was interviewed on the 10/16/15 episode of Fresh Air, the popular National Public Radio show. UPDATE: Listen to the Fresh Air segment on NPR here!